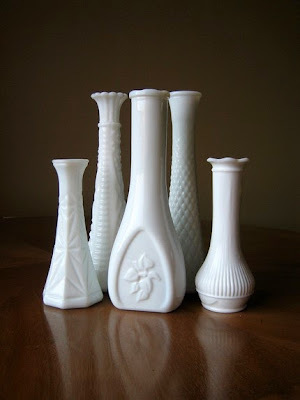 i am in love with milk glass at the moment. there's just something about it. it's so soft and pure. i, for one, do not have the finances to indulge in the luxury of vintage milk glass pieces. i'll definitely be on the lookout for reproductions on my next thrift shop venture. e.t.a. apparently vintage fenton pieces aren't as expensive as i thought they'd be. win. "First made in Venice in the 16th century, colors include blue, pink, yellow, brown, black, and white. 19th-century glass makers called milky white opaque glass "opal glass". 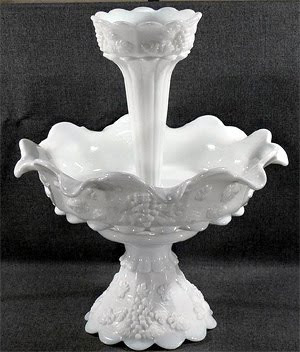 The name milk glass is relatively recent. The white color is achieved through the addition of an opacifier, e.g. tin dioxide or bone ash.